Express your own personal style through your home decor with help from the Expressions Catalog, your main source for home interior gifts where you'll find a wide assortment of charming gifts for the home and accents that will add warmth to every nook and corner. Expressions Catalog - Whether you're shopping for your own home or the home of a loved one, the Expressions Catalog helps you decorate your home like the professionals with a fine selection of home interior gifts for every area of the house. Shop for gifts for the bedrooms and bathrooms, the living room, kitchen and dining room, office or library as well as outdoor accessories and home gifts for the garden or patio. Home Interior Gifts - Discover a catalog filled with home interior gifts that you'll want to share and keep for yourself! Shop for home decor essentials including wall decor and prints, lamps, clocks, rugs, mirrors, pillows and throws, festive seasonal accents, items for the bed and bath, table linens, kitchen and dining accents and more delightful collectibles and accessories for the home, all featured in the Expressions Catalog. Personal Expressions - Besides a handsome collection of gifts for the home, the Expressions Catalog also brings you an assortment of wearable gifts to choose from. You'll find everything from clothing and accessories including cozy sweaters and slippers to sleepwear and loungewear for Misses and Plus Sizes, plus the Expressions Catalog also showcases a fabulous selection of jewelry and watches that are ideal for gift giving! 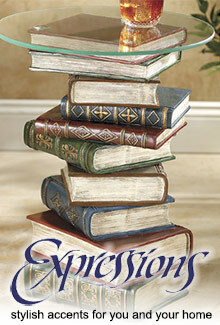 Expressions Catalog Style Galley - From Asian to Old World, Victorian to Tuscan, the Expressions Catalog allows you to shop for home interior gifts and accents, based on your favorite style of decor. Check out the Expressions Style Gallery for Coastal decor, French Country, Garden Floral accents, Tropical, Rustic & Cabin, Traditional home decor and gifts for the home featuring even more themes from around the globe. For the parents or grandparents, the hostess, the gardener or the dog lover, the Expressions Catalog will provide you with the ideal home interior gifts for anyone who takes pride in their home and all of it's contents.